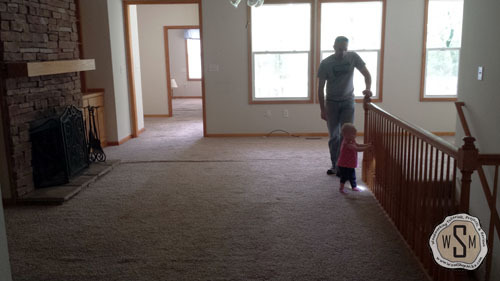 The carpet has been vanquished and the stairs leading down to the basement are next. What do you need to pump you up and get you through a project like removing stairs? A vision! And boy do we have one. 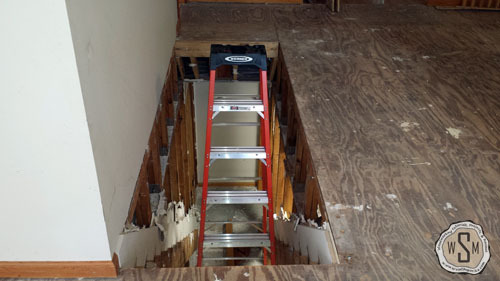 We just felt like the stairs were in one of the worst possible spots in the house, so that just had to be fixed. Before I got started the carpet was removed. 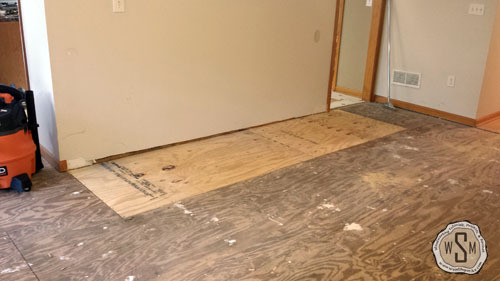 Follow this link in case you didn’t catch the post on Removing Carpet Like A Boss! 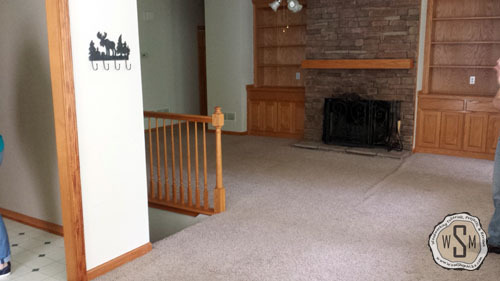 As you can see, the stairs are positioned against the wall that divides the kitchen and den. This would be ok… I guess (eye roll) if it weren’t for the fact that we’re going to be making a big hole in that wall to open up the spaces in addition to having the dining room table positioned close to the stairs. I can just see an uncle getting up from the table and tumbling backward down the stair case. Not to mention the only “good” place in the den for a couch would have been along the banister rail. I don’t know about you but I hear that kids like to jump on couches… Remember the concern about an uncle??? It’s at least double for a kid jumping over the banister rail and ker-splating on the stairs. So you get the picture, the stairs gotta go. Here’s how I went about it. First I studied how the stairs were being supported and evaluated if removing them would cause any structural compromise. We also had a contractor out to give things a look and bid the project. Once it was clear things would be fine, it was time to get started. 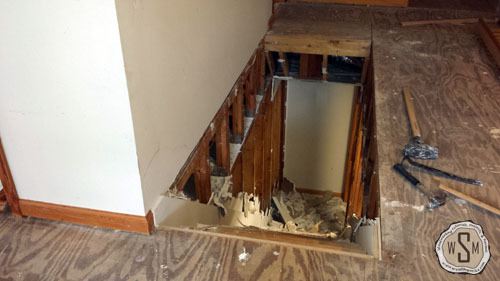 Oh, and just in case you’re wondering, that bid to relocate the stairs and make the opening in the wall between the den and kitchen was for $18,000! 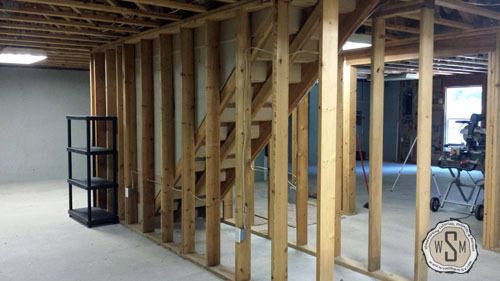 Here are a few shots of the staircase before beginning with the removal. 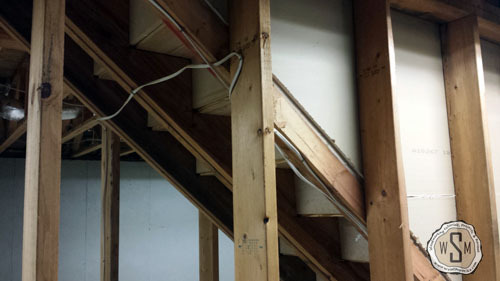 Since the walls that frame the stairwell are load bearing, I’m not going to tackle shoring up the trusses so that I could remove these walls. Instead, I’ll utilize it for storage of either home decor, disaster preparedness, or shop supplies. 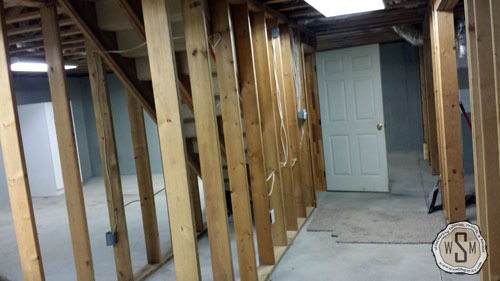 I had to first disconnect a few electrical outlets as the cables were running under and around the stairs. 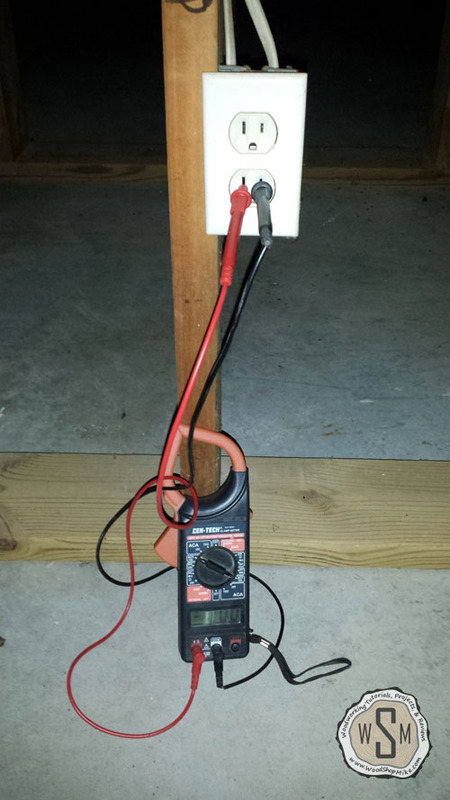 Make sure to kill the power to all outlets you’ll be working with and check with a multimeter, lamp, corded drill, etc. that the power is in fact off! 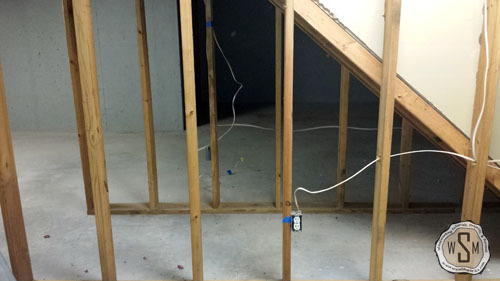 All cables clear of the “drop zone” in the project area! I bundled the disconnected end of each wire on a separate stud and labeled them as I disconnected the cables to make hook up a bit easier. I didn’t want to rely on memory to figure out where the wires were suppose to go once this project was finished. 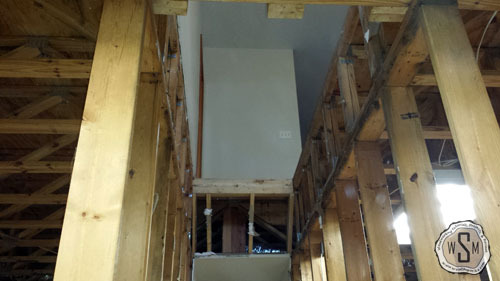 I started off with removing the drywall, which was glued and screwed to the studs. 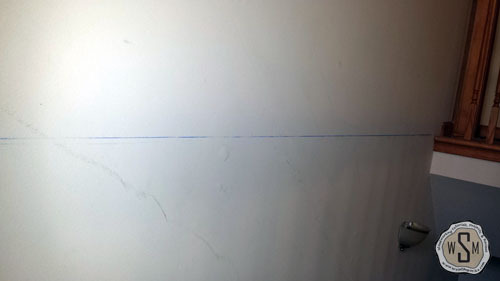 I made sure to not get too carried away and remembered to cut a line along what would be the bottom of the wall once the new floor was installed. A chalk line is a beautiful thing, isn’t it? While I was removing the drywall I had to stop for a minute to remove a light box in the stairwell. 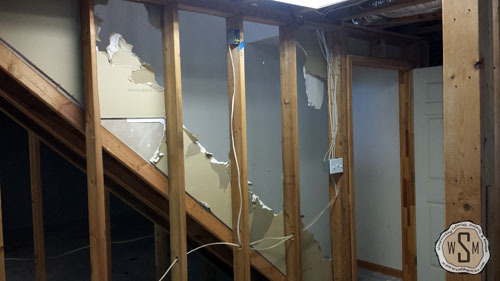 Fortunate for me, the breaker I had to cut off meant I also had no lights on that side of the stairs… No window either. 🙁 But, this LED flashlight by RIDGID ended that problem! 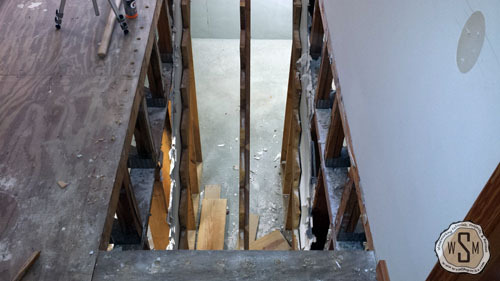 With all the risers and treads removed, we’re left with just the stringers, which need to be removed preferably in one piece so that I can reuse them for the new stairs. Again, this is just basic demo. Pry, hammer, and curse as needed. I started by removing the fasteners/prying the stringers loose at the bottom and working my way up. 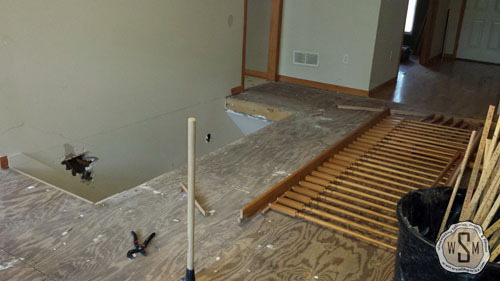 I left the stringers nailed into the header/blocking and removed those last few nails from the main living floor and simply let the stringers fall to the basement floor below. This allowed me to be completely out of the way when the stringers came down. Good news…none of them broke! You may be asking why I decided to put a ladder in the middle of my once perfectly good stairwell. The answer is simple… This is how you get down to the basement when you lock the basement door and realize that your house key (that is suppose to fit “all the locks in the house”) does not unlock the basement door… Bummer! Before I started hanging new joists, I pulled the remaining nails that were left behind from removing the drywall and stairs. 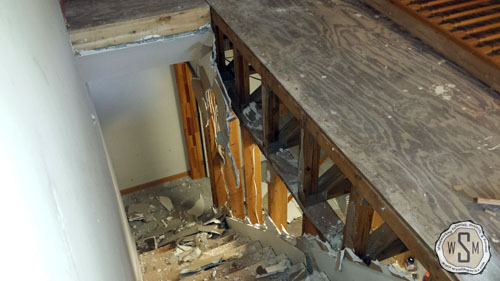 Also, I realized that a portion of floor close to the stairs was not very sturdy. 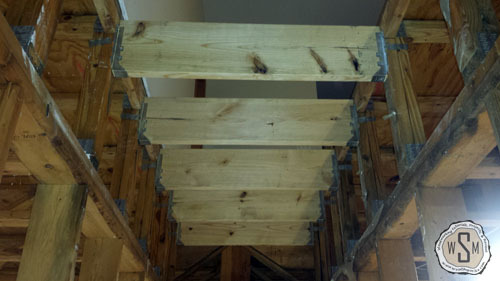 You can see in the photos that it is supported by a few 2×4’s that are angled to run parallel to the staircase. 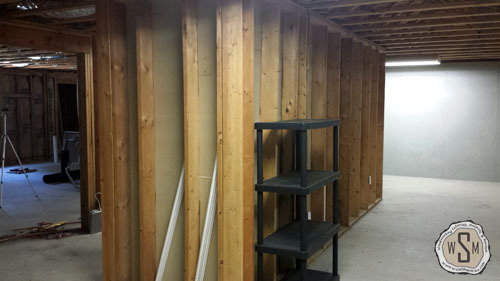 I decided to go ahead and remove this section as well and rebuild it so that the entire area will be sound. 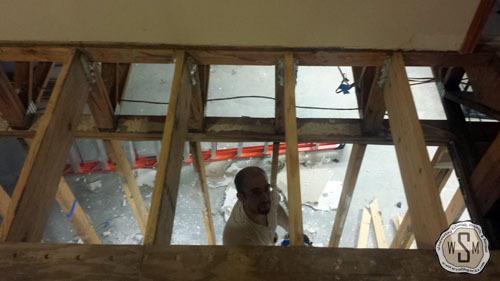 Adding the joists was definitely the most time consuming part of this project. Not only was I very particular about how accurately they were positioned, but installing the joist hangers into the yellow pine trusses was not exactly a quick process. 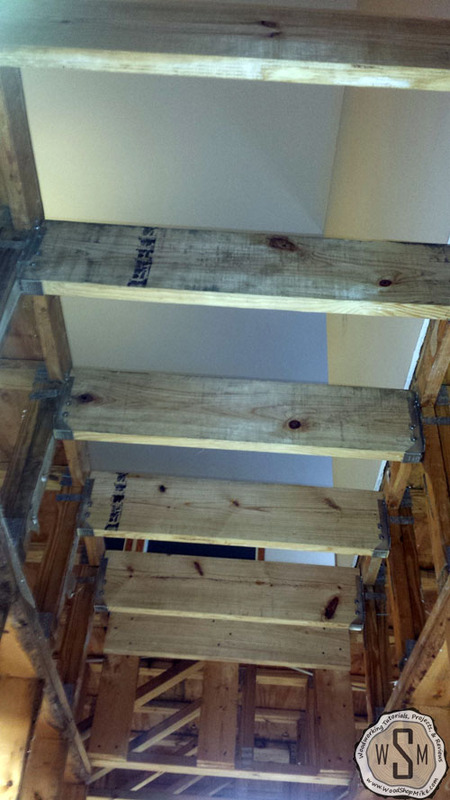 To hang the trusses, I used simpson joist hangers with 2″ and 3 1/2″ 10d nails. 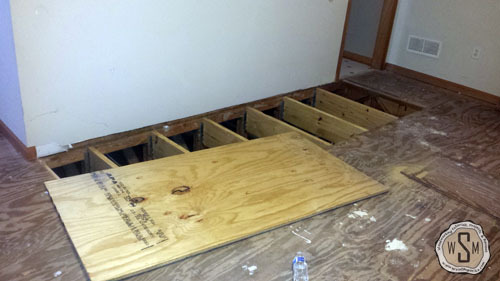 Also, given my natural tendency to overbuild things, I used 2 x 10 joists to support this new section of floor. Let me tell ya, it’s solid. 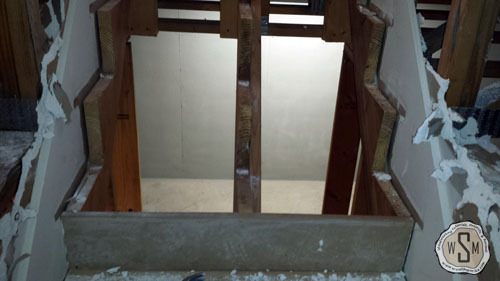 While installing the joists, I centered them on the existing trusses and added blocking at each end of the opening to support the plywood subfloor. Before putting the joist into position, I toe nailed the top at each end just enough for the nail to almost break through the end of the joist. Then, I’d position the joist and somewhat gently drive the already started toenail into the truss about half way. Here are some shots of all the trusses installed to give you an idea of where I placed the joists in relation to the trusses. 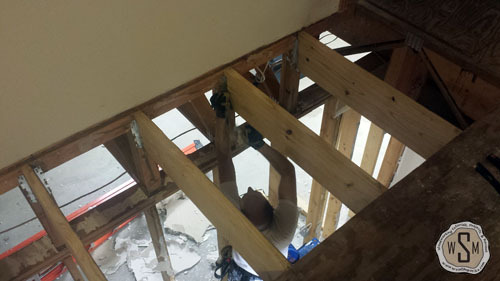 At this point, I’d repeat the process on the other end of the joist; the only exception being that I’d drive the nail in all the way this time. Obviously go back and finish nailing the first toenail. 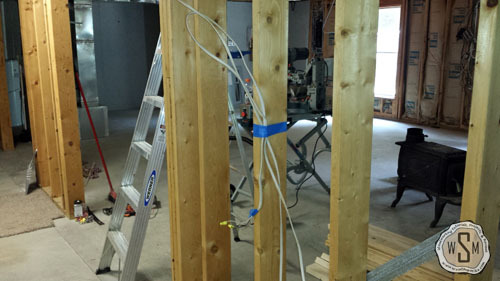 I used this sequence to mitigate the joist moving out of place while being nailed. With the joist toenailed, I added the joist hangers to each end. 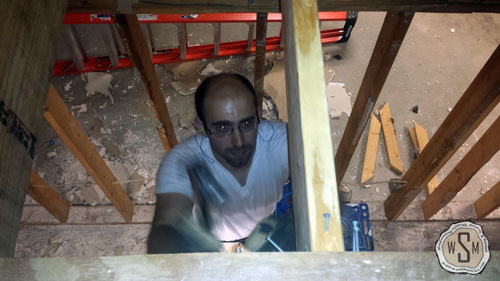 To do this, I place the joist hanger under the joist and with one hand pinch the hanger against the sides of the joist while (with the other hand) hammering in the speed prongs. From this point, I get some 3-1/2″ 10d nails started in the top two holes of the joist hanger. This way if the speed prongs loosen up while nailing the joist hanger, I don’t have to reposition the hanger. 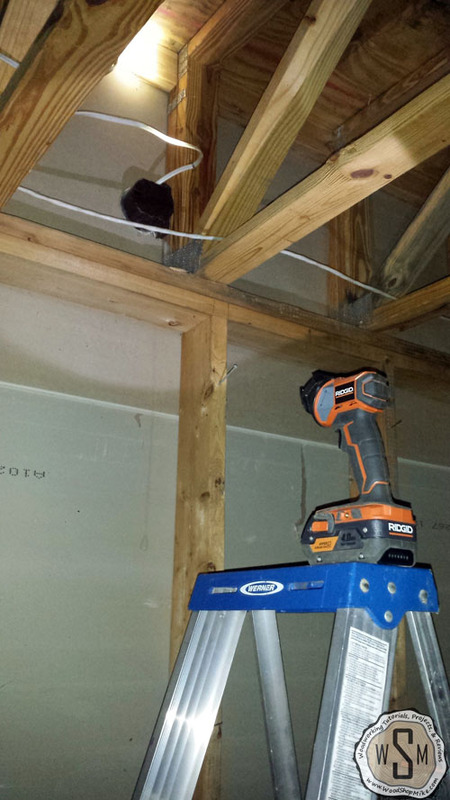 From there I add nails to all the holes on the joist hanger and drive them fully into the trusses. Then finally I add the nails to fully secure the joist in the hanger. Don’t I look so happy to be done hanging joists! Ok, mainly tired but I was glad to have that done. 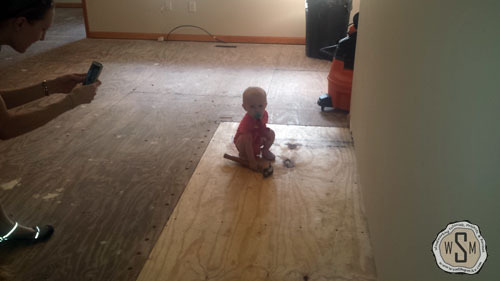 I don’t know about you, but this looks like a great time for new subfloor! It’s a new day, erg..evening after work, and it’s time to once and for all close up the old stairwell. I used 3/4 plywood and cut it so that there’s a 1/8″ gap at each seam. 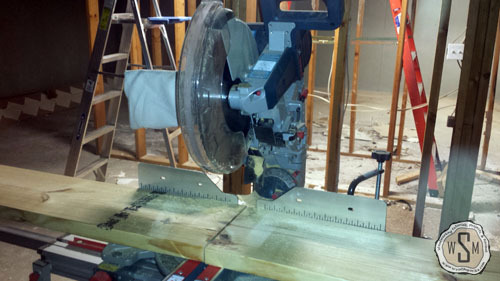 I used #8 x 2-1/2″ construction screws to secure the subfloor to the joists and blocking. Do not use drywall screws! They will break and you will cry… It’s just not worth it. Using the ole’ belt sander to make sure the seams are nice and level before calling this job done. I used a 36 grit belt and let me tell ya, that gets with the program! Man, it feels good to have this one wrapped up! 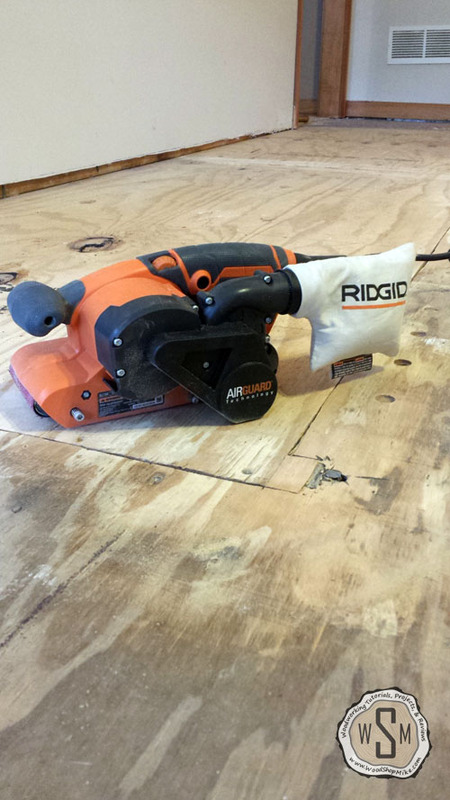 On to installing hardwood floors! Got questions or comments? As always feel free to comment and I’ll get back to you! Thanks for reading! Now how do you get to your basement? 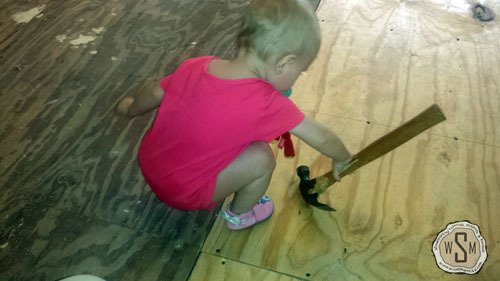 We have a similar situation in a house we want to renovate. Did you add a new staircase somewhere? Let me know if I can answer any questions along the way! I was wondering how much did you spend closing the stairs? It only cost about $120 to remove the stairs! The total cost to remove and relocate the stairwell was about $1200 in material since there was a fair bit of new construction in the relocating phase of the project.